Home ⎢Apply now for WDHOF scuba diving scholarships! 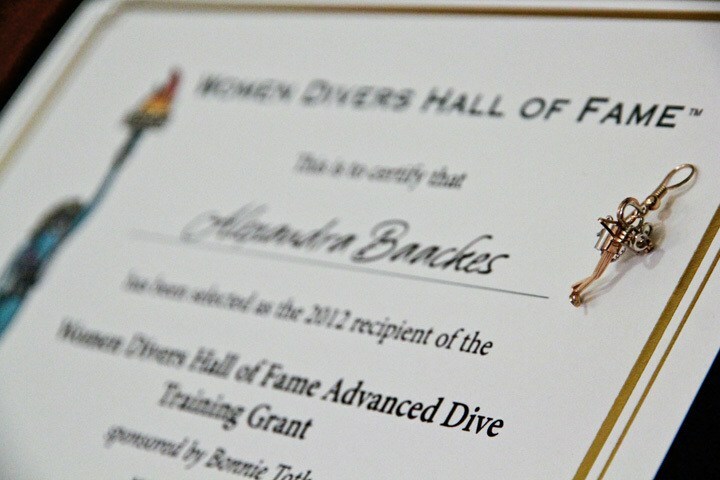 The Women Divers Hall of Fame annually awards scholarships and training grants to provide financial and educational support to individuals of all ages, particularly those who are preparing for professional careers that involve diving. Scholarships are offered in marine conservation, marine biology, underwater archaeology, education (marine or freshwater), dive instructor education and dive medicine. They are intended to support independent research and/or internship programs. They do not support living expenses or student loans. Scholarships are paid or awarded directly to the recipient. Training grants provide funding for diving and related underwater training and, for some awards, scuba equipment (but only after dive training has been completed). For training conducted in the United States, funds are paid directly to the training facility and/or the equipment vendor upon WDHOF’s receipt of an invoice; they are NOT paid directly to the grantee. For training that is not conducted in the United States, the awardee will be reimbursed after she/he completes the training. You don't have to be a female diver, nor a US-based or US-born diver to be eligible to apply. Each grant does have a number of requirements and they are detailed on the WDHOF website. You may apply for only one scholarship or training grant per year. However, if you are not selected for the scholarship or training grant for which you applied, and you are qualified for another scholarship/training grant, you may be considered for another award. Please read the scholarship and grant descriptions, requirements, applicant qualifications and application instructions very carefully, and refer to the specific requirements as you complete your application. All applications require two letters of recommendation, which must be submitted directly by the reference, and not by the applicant. It is your responsibility to ensure that the letters of recommendation are submitted by the deadline. Applicants MUST complete the online application form. Incomplete and/or late applications (including letters of recommendation) will not be accepted for further consideration. The deadline for receipt of applications is 31 October 2017, midnight US Eastern Standard Time. Applicants will be notified of award status by 1 February 2018.